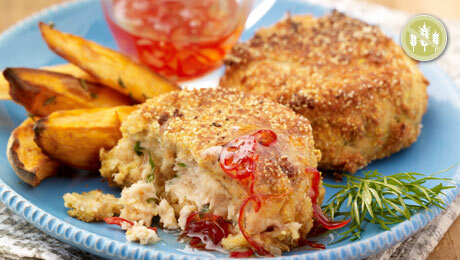 Salmon works well in these fishcakes as its an oily fish, you could serve with some potato chips if preferred. In a large pot, place the potato covered with water and bring to a boil and simmer for 20 minutes until soften. Drain the potato and mash with a potato ricer. Keep aside until required. Place the salmon into a large saucepan and add the milk, if this does not cover the salmon completely add a little water until the fish is totally immersed. Bring the milk to the boil, then reduce the heat and simmer for 5 – 8 minutes until the fish is cooked through. Remove the salmon from the liquid with a slotted spoon and transfer to a bowl. Flake the fish ensuring all bones are removed, then add the mashed potatoes, lemon zest and juice, mustard, cayenne pepper and chopped coriander. Shape the mixture into patties approx 5 x 2 cm and place onto a tray lined with baking parchment. Coat the fishcakes in the gluten free flour, then dip into the whisked eggs and then coat with breadcrumbs. Chill into the fridge for at least 30 minutes. In the meantime, place the sweet potato onto a baking tray. Season with salt, pepper and thyme; then drizzle with 3 tbsp of rapeseed oil. Bake in the oven 25 – 35 minutes in the preheated oven or until golden brown and cooked through. When the fishcakes have firmed up remove from the refrigerator and prepare to cook. Drizzle a little oil onto a non stick frying pan and carefully place 2 – 3 fishcakes onto the pan. Fry for 5 – 8 minutes on each side until a golden brown colour and hot through. Serves the fish cake with a drizzle of chilli and garlic sauce, and the roasted sweet potatoes. Place the chillies and garlic in a pan with the sugar and vinegar and bring to the boil, stirring until the sugar has dissolved. Reduce the heat and simmer for about 10 minutes or until reduced by half. Remove from the heat and leave to cool completely, then transfer to a bowl and cover with cling film. Place in the fridge and use as required. It will keep for up to six months.